A trip to Greece seems incomplete without a visit to one of Greece’s famed islands. But without a lot of time, getting to isles like Mykonos or Santorini is a challenge. Plus, summer ferry tickets sell out fast and accommodations on those fancy islands can be pricey if you can even snag a room. Skip the hassle and do like the locals. Get yourself to one of the many beautiful islands that you can reach from the port of Athens in 40 minutes to two hours. Ride a rented bike to beautiful beach coves, lunch at lovely restaurants, and enjoy a break from the bustle of the capital city. Here are our favorite Greek islands you can day trip to. Aegina, pronounced like EGG-ee-nah, is the closest island to Athens. You can get there in 40 minutes from the Port at Pireaus. Aegina is more low-key than islands like Spetses or Hydra, which are popular destination isles for wealthy Athenians. More importantly, it has one of the most complete temples in Greece. The 2,500-year-old Temple of Aphaia is a five-minute bus ride from the port or just a few minutes more by scooter. You can rent a scooter right at the port and explore the whole island easily. Or you can just walk due north of the port and see the ruins of the Temple of Apollo, which are not as complete as the Aphaia temple, and a lovely beach beyond that. The stunning Kolona Beach is a five-minute walk north of the Temple. The long sandy beach is often empty, even during the summer. Also, try some of Aegina’s famous pistachios, possibly the best you’ll ever eat. The hawkers at the port will sell you pistachio everything: pistachio butters, ice cream, crepes, cookies, etc. Agistri is right next to Aegina. It takes just an hour to get to, but it’s beautifully uncrowded. You’ll find only locals and other Greeks on the island, and very little infrastructure — just a handful of tavernas make up the dining options. Agistri is small enough to bicycle around in a day. The port has rental options starting at 5 EUR (just over $5). Agistri has plenty of beautiful beaches — Dragonera being one of our favorites. Dragonera is usually empty and right next to a large forest. One side of the beach has a bar, but the other side has secluded coves at the base of large cliffs. 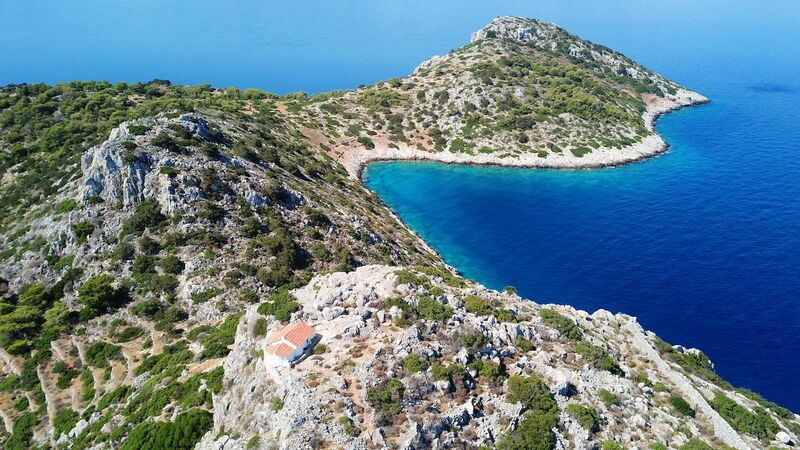 Although you can easily spend a day in Agistri and be back in time for dinner in Athens, it’s also a popular place for overnight camping — given that it’s much less developed than some other islands. 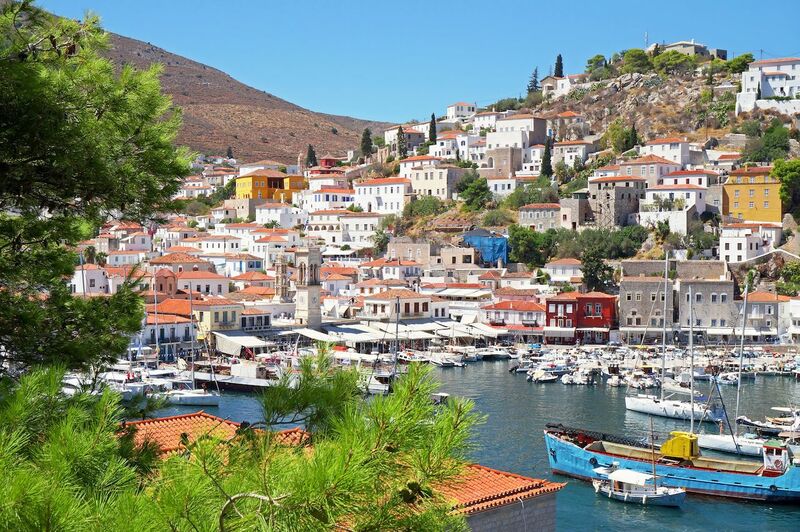 In about an hour, a boat from Piraeus will bring you to Hydra, an elegant island chock-full of restaurants, shopping, and a handful of beaches. Hydra famously does not permit any motor vehicles, and that’s just as well — the roads don’t take you very far. Most of the island is mountainous, with the tallest point reaching nearly 2,000 feet. If you wanted to get to the far side of the island, you’d probably need a private boat. No matter, because all of the activity in Hydra is concentrated near a lovely port city, which is framed by the taller peaks. After lunch at one of its restaurants, check out the pretty boutiques in town. You’ll see the artisans making inexpensive jewelry and can even ask for a customized piece. West of the port is the tiny Kamini Beach, where you can have lunch at a restored armory. Don’t confuse Poros with Paros, a fancy island in the Cyclades that takes a lot longer to get to. Poros can be reached in an hour on the hydrofoil from Athens. 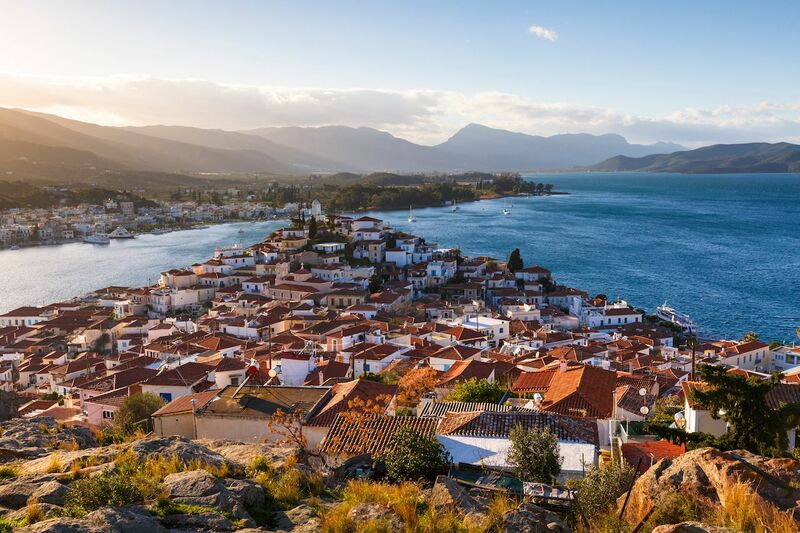 It’s very close to the Peloponnese — the part of Greece that is home to Sparta — and you can see the impressive Peloponnesian peaks from the island. Poros has plenty of interesting things to check out. The first step would be to climb its 90-year-old clock tower by the harbor, both to orient yourself and to see the clear Mediterranean. The Temple of Poseidon is on the north side of the island and if you want to see more artifacts, you could check out the Poros Museum. However, if you already got your share of history in Athens and just want to enjoy the sea, check out the beaches at Monastiri and Russian Bay. 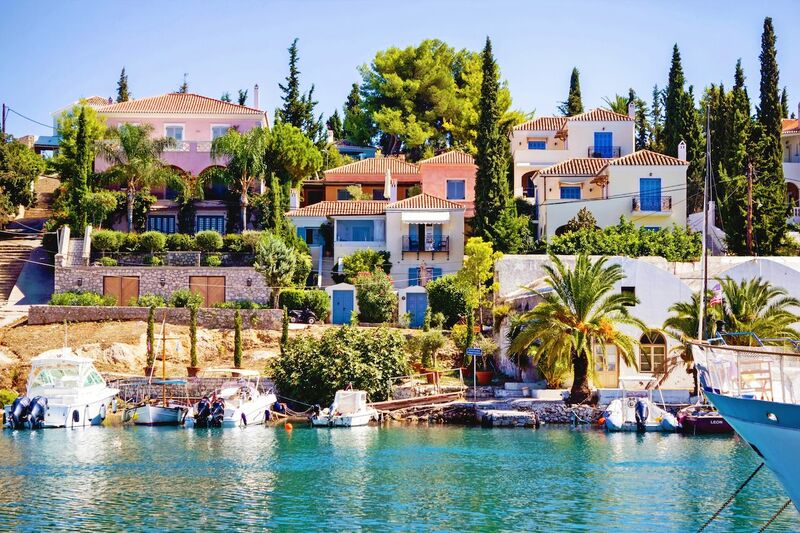 Spetses is the farthest island on this list, but it’s still doable for a day trip. A ferry from Piraeus will get you there in two hours. Spetses prohibits private cars, but a handful of taxis on the island will take you where you need to go. A more fun option is to rent a scooter, which you can do right at the port. 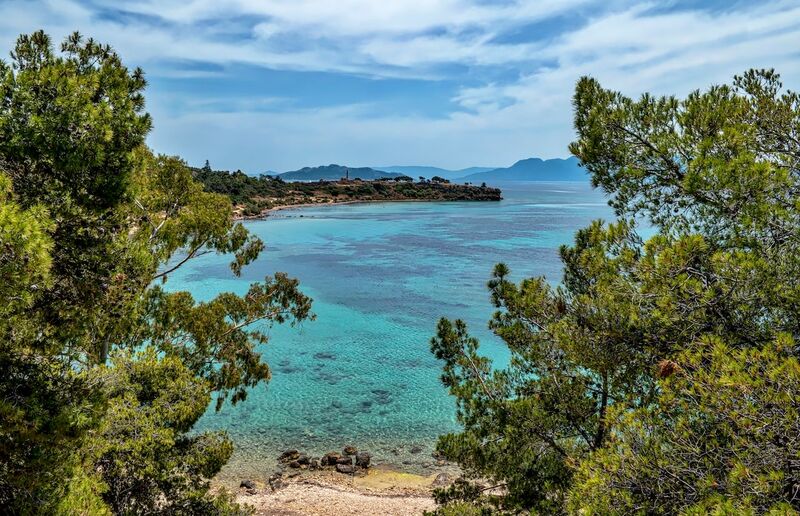 The best things to do in Spetses is to explore one of the beaches on the island. Agioi Anargyri is a big beach with umbrellas that’s worth checking out; from there, you can walk along the rocks and swim into Bekiri Cave. Plenty of moneyed Athenians have weekend homes in Spetses, but the island still doesn’t feel crowded.